Fast. 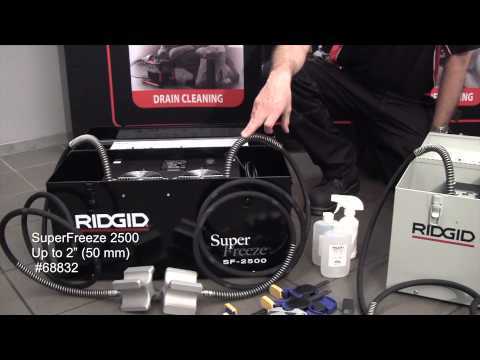 - The powerful compressor in combination with the 3-cavity direct freezing heads forms ice plugs in just a few minutes. Portable & Robust. - No bulky gas cylinders. Self-contained unit in site proof metallic case with transport resistant compressor, is easily carried from job to job. Safe. - No dangerous dry ice or toxic fumes. Contains CFC free refrigerant. Convenient. - Repairs can be made close to the frozen part of the tube and without the need to drain the entire system. Designed for continuous use. - No risk of running out of C02 dry-ice gas during repairs. 3-cavity direct freezing heads allow fast and optimum freezing performance. More flexibility with use of inserts on the 3-cavity head for 12, 15, 22, 35 mm steel and copper tubing. 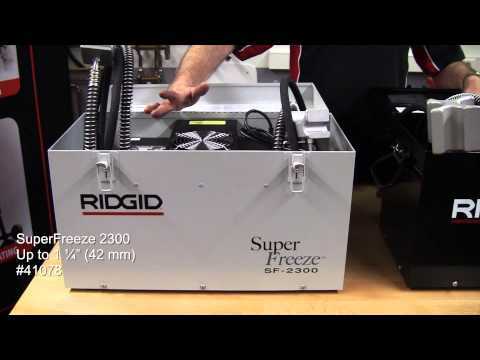 Hose connected perpendicularly to freezer head. Allows easier working in restricted spaces and on pipes close to wall or near floor. 2,5 mm thick, 1,98 m long rubber hoses with protective springs against wearing ensuring longer hose life time. Unique Freeze Gel formula sticks to the freeze heads without dripping off and helps reducing freezing times.